I am so excited to be competing in So You Think You're Crafty and even more excited and honored that my audition craft took first place. Now, I am going to show you how to make your own. There isn't a whole lot of supplies that you need for this. Large carriage bolt, I used 10"x 5/8"
The trickiest part of making the bird feeder is drilling your holes. Plastic has a tendancy to crack, chip and break. I will show you how to avoid that. Take a block of scrap wood and place it directly under where you are drilling. Even with the block of wood, because the bowl and plate isn't perfectly flat, you might have a bit of chipping, but that shouldn't be a problem. You are just trying to avoid cracking the plate or having a large blow out. See, even mine chipped. Not a big deal, it won't be seen. Once you drill the holes in the center of your bowl and plate, it's time to assemble your piece. Place a washer on your bolt and then bring your bolt up through the bottom part of your bowl. It will be very wobbly, so you will need to sandwich the washers around the bowl with glue. The order goes, washer, glue, bowl, glue, washer. Then you will take a nut and thread it a few inches down. Your plate will sit directly on top of this nut. 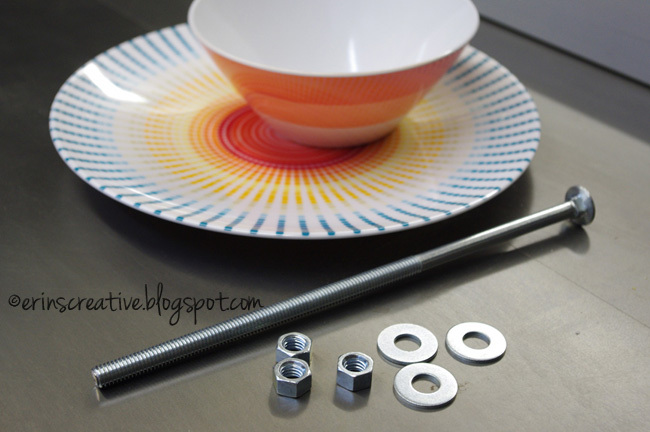 Place your plate on the nut, then thread another nut so that the plate sits between the two. Hand tighten them so your plate doesn't move, but not so hard that you crack the plate. Then place another washer and another nut on your bolt. This step is only necessary if you used a carriage bolt like I did. 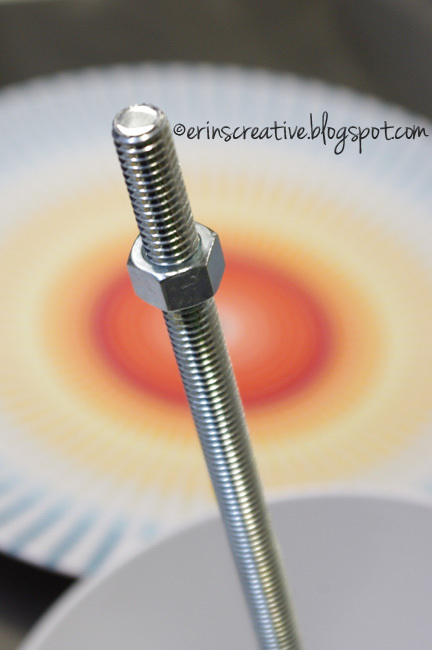 If you found a large eye bolt, your assembly will be in reverse. I will show you the the reason for the stacking of the nuts and washers on the top. Did you ever do make lanyard keychains/bracelets out of the plastic cord as a kid? I hope so, because that is how you are going to make your loop. So, cut yourself two pieces of nylon cord about 2 feet long each. 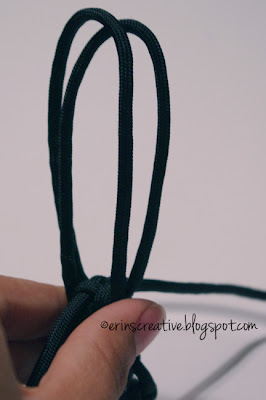 First, tie a simple overhand knot (the first knot you make when tying a shoe) with each piece of cord. Make sure the knot is around the middle of the cord. Then you start doing a lanyard knot (technically called a crown sinnet knot) over the top of the washer, but make sure your overhand knot stays tight while doing so. 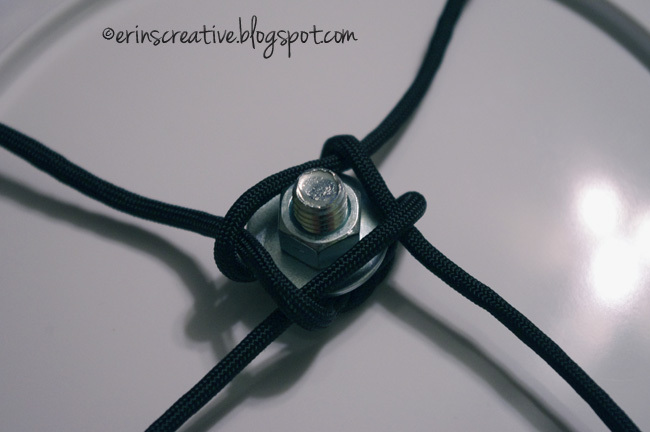 If you aren't comfortable with your overhand knot, glue it before proceeding to your crown sinnet knot. I found a great animation on how to do the crown sinnet knot...so if you don't understand how to do it, please visit Animated Knots by Grog to check it out. 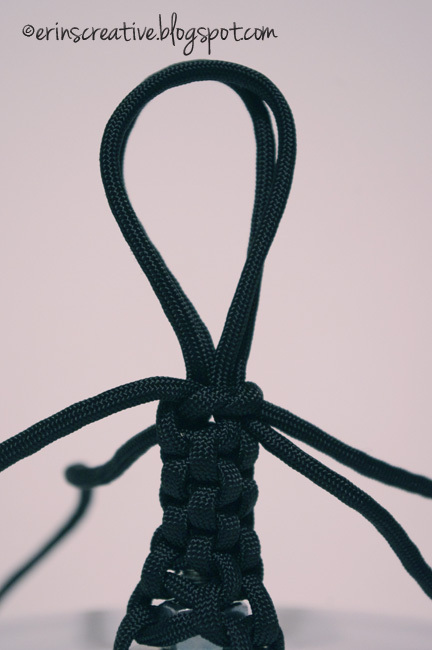 Once you have created a few inches of the crown sinnet knot, take two strands of cord and make some loops like so. 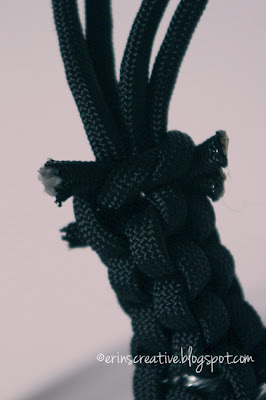 You will then take your two remaining strands of cord and tie an overhand knot around the base of your loops. You will need to burn the ends of your nylon cord. This will cause it to melt and expand a little. 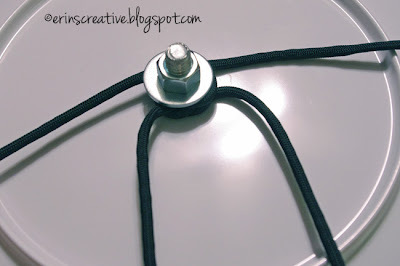 This will make sure your cord doesn't unravel and your knots won't come out. The above photo shows burned cord ends on the right, and unburned ones on the left. All you have left to do is go fill your bowl with bird seed, hang it outside and wait to see what feathery friends come to visit. It took less than a day for my first feathery friend to discover the new bird feeder. Once that happened, I've had regular visitors ever since! I hope you create your own bird feeder. I would love to see pics of any you make! If you have any questions, please feel free to ask. Congratulations, Erin, on your win. What a clever idea for a bird feeder. Thanks for this wonderful idea... I just love the colors you used. I will make a few for myself and my children.. again thanks for this ~ wonderful ~ ides...We I get them done I will send you photos. Erin..this is a wonderful idea..I can not wait to try and make one..its so cute and cute.. This is an Excellent invention! You rock! Great. I intend to make it. 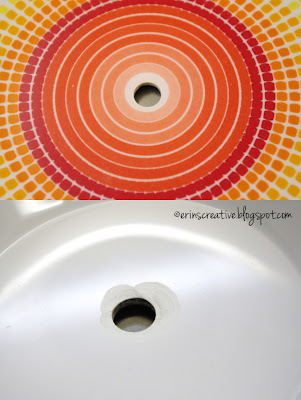 Perhaps a tip to avoid that cracking and chipping of the plastic/melamine might be to do what people sometimes do when drilling ceramic tiles: place a little masking tape over the hole you're about to drill. All bests. This is adorable. Great idea! Congratulations on your win! This is really adorable! I'd love to make one of these for my dad, but his wife doesn't like all of the birds making a mess in the yard (and he already has quite a few feeders!). I might change my mind, though, since it is so cute! Thank you. It's a great feeder! The best part is the squirrels have a tendency to slide off the top. I hope you make one and would love to see it if you do. My 4 year old loves it. He is always asking which bird is which and will shush everyone when birds are present and he wants to watch them. Thanks for sharing, its such a great project. I especially love all of your beautiful 'visitors'! I love this project and just rummaged through some second hand stores for a few cute cups and saucers. I'm wondering if it would work with a dowel instead of the carriage bold. Or maybe I could just paint the bolt. Or maybe try hanging the cup using a chain or something. Any thoughts? The hardest part with a dowel would be figuring out how to attach a hook. If it was a large enough dowel you could screw a hook into the top. You could also definitely paint the bolt. The chain I don't think would work because the cup/bowl would tip over anytime a bird landed on the edge. Good luck with building one, I would to see a picture of one if you build it. Shared on the official CSF facebook, thanks ! 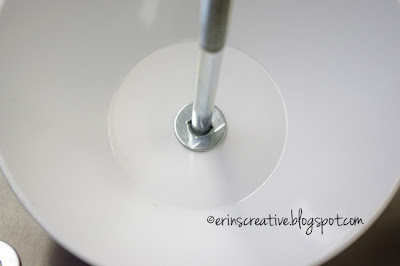 How did you get the bowl to stop wobbling? I made this today, using the exact materials you used, and the bowl has nothing to stick to and keeps rocking back and forth - perhaps Gorilla Glue's expansion while drying will help? It is very wobbly until you set the washers and bowl with glue. 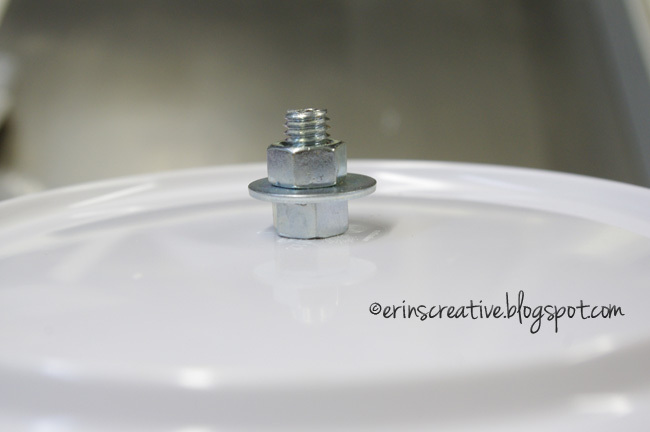 If it's still wobbly, add more glue around the hole in the bowl where the bolt goes through. I love this and can't wait to make one!! The knot is a great touch. Duct tape or shipping tape over where you will drill also helps keep down chipping. That works for ceramic too. 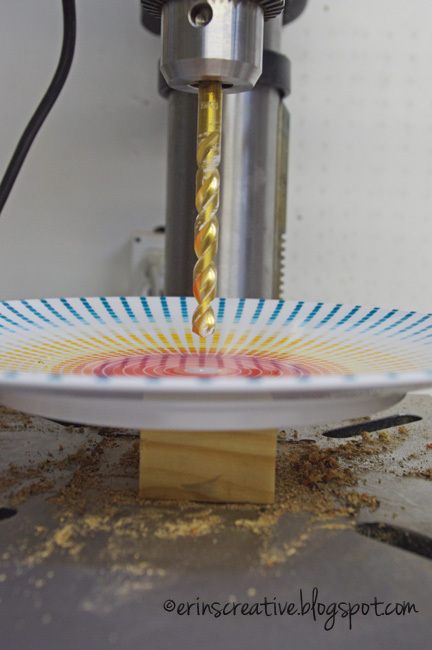 If you drill twice once with a smaller bit first then change to a larger one it might not chip at all. Or try taping the spot on both sides first and that may also help. Thank you so much...love it! 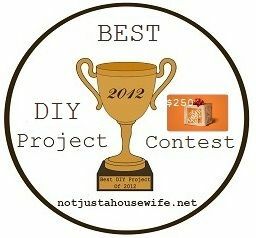 I would love to see your finished bird feeder! WOW !! pretty, elegant, durable... such a good idea. I will make one or two for my garden. THank you very much for your idea. You are very welcome. I would love to see any photos you take of yours. Wonderful idea. Can I share? THANK YOU FOR YOUR GREAT IDEA, CANT WAIT TO MAKE A COUPLE FOR MY OWN BIRDS. I ENJOY MAKING BIRD TOYS OUT OF USED BABY TOYS, THAT I GET AT FLEA MARKETS AND YARD SALES. 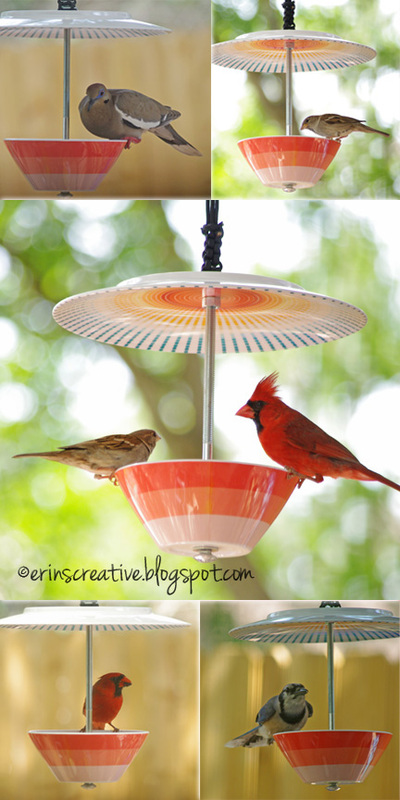 What an inexpensive way to make an adorable bird feeder!! I love this and have to pin it! Thanks for the tutorial on this. I love this idea! So much nicer than most store bought bird feeders. I saw your post and I liked it a lot! I decided to do also and loved the result.Look on my blog! Thanks!!! I saw some of these at our local market sale on the town square. Have searched online over an hour. LOVE THESE!!! I have a question about the drilling part. 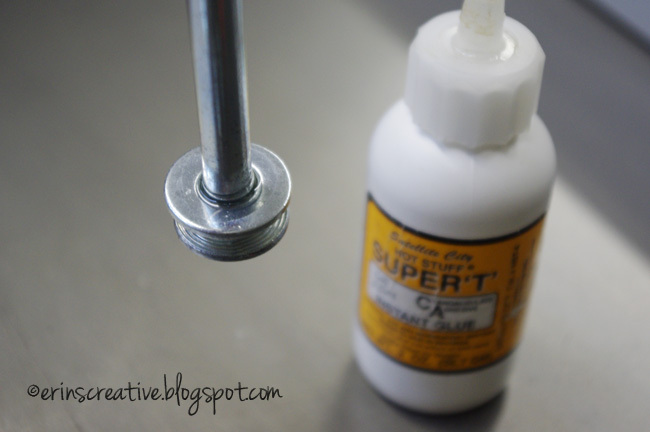 Can you use a hand drill to do this? It's the only kind I have. :-). Greatest and most crafty feeders ever!! I love this idea! What an awesome spruce-up for the backyard! This is so awesome! I think the the best bird feeders are ones that you can make yourself. I really like this idea, and I think I'm going to try making my own. Thanks for the post. Any problems with drainage? I worry about wet bird food. I thought a tiny colorful colander would be cute for the bowl. I haven't had any problem with drainage. My feeder is on the edge of a covered porch. The food has gotten wet before, but not soaked. The birds keep it relatively clean (the sparrows do a great job at throwing out all the shells and husks from the seed). I don't see water being a problem if your plate on top is large enough and you take it in if you expect a large/windy rainstorm. I would love to see your feeder if you make one. I LOVE this project!! My dad loves to sit on the porch and watch the birds in the yard. Now I have a Christmas/Birthday gift that he can actually enjoy. Thank you for sharing! This is so creative! I am impressed! Remembered this pin this morning. I was disassembling a trophy bound for the trash. I was looking to get some findings and raw materials for miniatures projects and in the process salvaged 3 carriage bolts with nuts and washers. Now to get me some pretty bowls and plates. I may save this project for when my niece gets here for a summer visit next week. I'll bet she knows those knots. Thanks for sharing this! This is such a good idea. I have been looking for some discount bird feeders online and I didn't realize how easy it would be to make your own. I am looking for discount bird feeders online, does anyone know where I can find some? Now that is what I call a discount bird feeder. You can make this from things that you have at home. It is really nice too and it is not something that will cost you a bunch of money if you wanted to go and get new items to make this. These are darling! And this way you can pick your patterns and colors to match the house! I'd love to get my kids more interested in all the animals we have just in our backyard. Thanks for posting! My mom is a huge fan of the birds that come and nest in her trees. I would love to surprise her with some crafts that we can assemble to make our own bird feeders. She is less mobile, and I want to spend the afternoon with her assembling bird feeders and chit chatting. 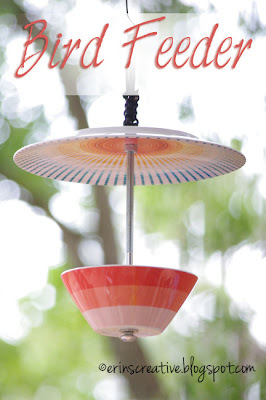 This bird feeder is so cute! It seems pretty simple too! I would love to try this soon! I will have to go buy the supplies! This is so darling! I would have never thought about making a birdhouse or feeder out of beautiful chinaware! When is the best season to put them out ? And how soon would you say they start coming? What a cheap way to make an adorable bird feeder!! I love this and have to pin it! Thanks for the tutorial on this. Also i have a bird feeder of my own named Peck-O-Matic a Poultry Demand Bird Feeder Kit. I must say, usually I'm not a big fan of smaller scale projects like this, but this is an awesome idea! I'm already trying to decide which saucer and bowl I'm going to use to make it. My wife will totally love this once it's finished. Thanks for sharing your great idea! I have made a bird feeder at my house using BirdFeederguide.com but I see you have made way too beautiful birdfeeder than me. In pvc fence regina we have unique soil conditions that require durable solutions that protect from ground heaving. Typical wood fence products cannot withstand frost heave yet the vinyl PVC solutions we provide can be adjusted yearly in order to maintain a level and consistent look among the vinyl PVC installations that our customers use. Beautiful, thanks for sharing Erin! I wonder if you could turn the plate right side up and use for birdseed and the bowl for water? Awesome bird feeder!I guess you must be a kind and warm-hearted person.I love your idea! DIY craft doll making tutorial.